Somehow, I have the feeling I managed to hit the London Film Festival at just the right time, in just the right spot. Midway through the festival I secured the viewings of two films and two only, but my gut feeling tells me they’re probably two of the very best in the programme. I’m yet to see “The Boy Who Was A King” by Andrei Paunov (BG cinema in London, yeaaah), so more on that one later I guess. But last night I sat in a movie theater, my wife clinging, terrified, to my elbow, gripped by the true, brutally honest, politically and physically and visually charged spectacle that is Miss Bala. There are very few movies that are so categorical in what they are that they grab you by the throat and don’t let go, and don’t allow you to question yourself – whether you like what you are seeing or not – until after the credits. Miss Bala is one of them. It’s a tense, terse, violent thriller that moves solidly in one direction, stays the course, and doesn’t ask unnecessary side questions. Miss Bala is actually Laura Guerrero (played by the brilliant Stephanie Sigman), a regular Mexican girl from Tijuana with dreams of becoming a beauty queen. By the end of the movie her dreams are fulfilled in a devastating, soul-destroying manner. It’s no good giving out any plot points – as the director Gerardo Naranjo told in his post-screening chat, he initially set out to do a thriller, and, in this sense, Miss Bala is a powerful success. But it also offers a very painfully sober, bleeding view of a problem that haunts the society of a large country on pretty much daily basis. It seems Naranjo and his crew did their homework while researching the inner workings and the real-life vibes of the conflict “drug cartels-police” in present day Mexico. The way that the life of an unsuspecting nobody (Laura) gets caught up – and eventually grinded to dust – in these vile machine movements, is depicted with skill, precision, and love for the actual states of mind a real person experiences (as opposed to the parallel-world reality of, say, any ordinary Hollywood action movie). From the very beginning of Miss Bala, one gets transported inside the skin of Laura, and travels her journey together with her, actually sensing her terror, panic, temporary relief, hope, desperation, resignation… I really don’t know which is Naranjo’s bigger achievement – extracting such a performance from Sigman, or visualizing with such realism-based precision his obviously quality script. 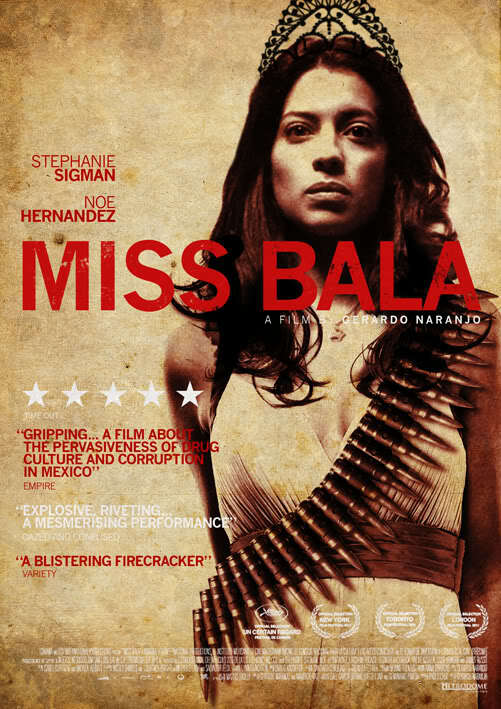 And coming back to the issue of films that grab you by the throat: once Miss Bala let go of mine, I realized the film had meanwhile planted the seeds of many important questions inside my mind. And that the time for gaining a perspective into such a major problem as the Mexican drug cartels are, the time for contemplating the moral of the film, the time for deciphering, post-factotum, the motivations behind each scene, each character’s acts, each relationship – has just begun. A definitely recommended movie, but be prepared to experience increased heartbeat rates.